A well-manned Pequot dugout canoe as it may have appeared about 400 hundred years ago on the tidal waters of southeastern Connecticut. This morning's steady rain and wind would qualify this as a perfect day to visit a museum and the Mashantucket Pequot Museum & Research Center is one of the best museums I have seen in regards to depicting life in New England before the arrival of the Europeans. 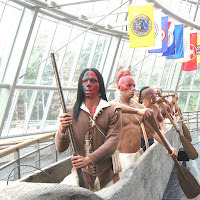 Visitors entering the museum will pass by two replicas of large dugout canoes and the people that may have paddled them, as they proceed towards the exhibits. I was captivated by the degree of realism and could easily imagine myself encoutering either craft emerging out of foggy coastal waters! Other, smaller dugout canoe replicas are seen in the 16th-Century Pequot Village exhibit which offers the closest thing to time-travel currently available. You will find yourself actually walking within a Pequot village. Also on display at the Museum are the remains of a real dugout canoe recovered from the muddy bottom of a nearby pond. Checkout the Museum's website at this link. It's the other reason to visit Foxwoods.